ENGLEWOOD, Colo. -- Oct. 25, 2017 -- (BUSINESS WIRE)--DISH today unveiled Hands-Free TV™ for the entire home by extending its support of Amazon Alexa voice control to all Joey clients. Now, DISH customers can ask Alexa to control all TVs in the Hopper whole-home ecosystem by pairing each set-top box with an Amazon Echo, Echo Show or Echo Dot. 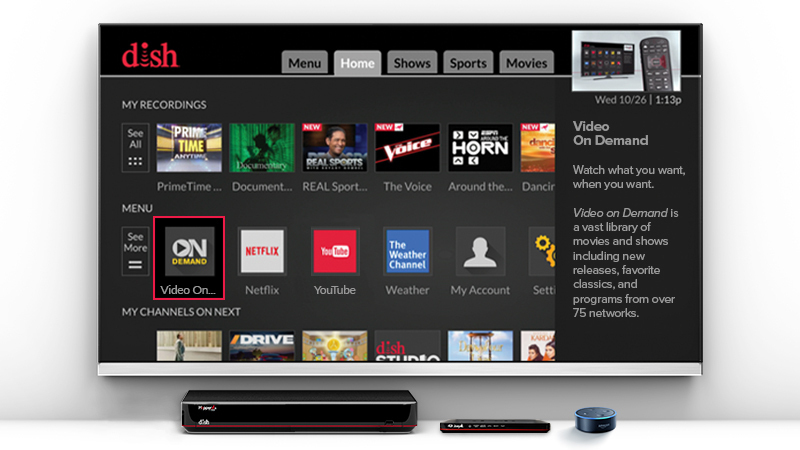 In April 2017, DISH became the first pay-TV provider to natively integrate Alexa voice control when it enabled compatibility on its Hopper DVR and Wally receiver. When connected to a Hopper, DISH’s Joey clients extend Hopper functionality to other rooms in the home. Hopper 3 supports up to six Joeys simultaneously, while previous Hopper generations support up to three Joeys. With today’s announcement, DISH’s list of Alexa-compatible products includes Hopper (all generations) and its Joey, Wireless Joey, 4K Joey and Super Joey clients, as well as DISH’s Wally receiver. To enable Alexa voice control, each DISH set-top box must be paired with its own Echo device. Enable DISH TV in the Alexa app: Open the Alexa app on a mobile device and select Music, Video & Books → DISH TV → Enable. If the DISH TV skill is already enabled from previous use, select Settings → Manage in TV and Video → Manage and Link Devices from the Alexa app, and proceed to step 3. Get receiver code: Turn on internet-connected Hopper or Wally, and go to Menu → Settings → Amazon Alexa → Get Code. Enter the generated code into the Alexa app and select Activate. Click Done in the confirmation message. Pair set-top box with Amazon Echo, Echo Show or Echo Dot: In the Alexa app, select desired Hopper, Wally or Joey receiver from list of discoverable devices. Click Continue. Select Echo device to be synced with chosen receiver. Click Link Devices. Repeat this step for all set-top boxes to be paired with Echo devices. For more information about Alexa on DISH, including possible commands and additional set-up instructions, visit www.dish.com/AmazonAlexaIntegration.